If you didn’t know that “rhinoplasty” is the medical term for a nose job, then there is your first fact. It happens to be one of the most common forms of cosmetic surgery today. Maybe you didn’t know that either. 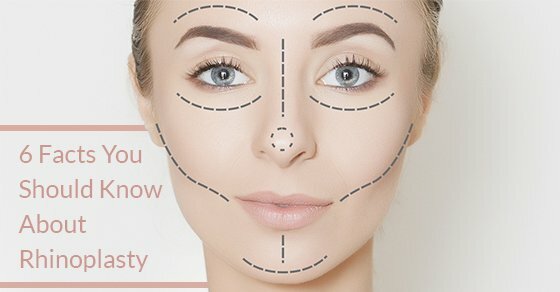 If you have ever considered having a nose job or thought a nose job cost was prohibitive, keep reading and we will give you some basic facts you need to know about rhinoplasty. About half of all rhinoplasty surgeries are for cosmetic reasons, while the other half are due to physical issues, e.g., birth defects or trauma or injury to the nose. Another common reason for a nose job is to repair a nasal blockage issue or deviated septum, which affects proper breathing. In order to qualify for a nose job, girls need to be at least 14 years of age, and boys need to be a minimum of 15. This is to ensure that their facial growth, or skeletal maturity, is stable. Sometimes shoe size is a way to tell. If their shoe size hasn’t changed in a year’s time, then growth is probably complete. Emotional maturity is another thing altogether. If you have a child who wants a nose job, confer with an experienced surgeon about the right time to do it. Each teenager should be assessed individually. If your rhinoplasty is required for medical purposes, it will probably be covered by medical insurance. Cosmetic procedures are not. Always request an estimate of nose job costs when coming for a consultation. Many patients shy away from even coming for a rhinoplasty evaluation because they think the procedure will hurt. Dr. Oakley Smith will use lights and some measurement tools to assess your nose and suggest what needs to be done. If you wish to change your nose to improve your overall appearance, an evaluation is the first step. There are no pushy sales pitches. We want you to be completely comfortable with your decision. Yes, the angle and slope of male and female noses are different. For the best results, find a rhinoplasty surgeon who recognizes that difference and who understands the art needed to feminize a woman’s nose and face. Such a doctor will specialize in rhinoplasty and dedicate their entire website and practice to the art of nose jobs. Look no further than Dr. Oakley Smith and his professional staff. If you are considering a rhinoplasty, contact us for your consultation appointment or with questions about nose job costs.